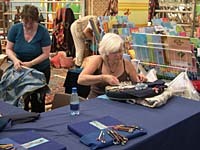 Many of our members enjoy attending the lace days of other groups in the area. 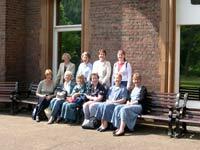 Our last Lace Day was in 2010 and unfortunately this was our last one for the forseeable future, so a big thank you to all our loyal friends who supported us in the past. A lace and craft day has been arranged on 27th April 2019 at Denton Village Hall from 10am till 4pm, This is entry by ticket. A further date has been arranged on 28th September 2019 at Lavenden Village Hall also from 10am till 4pm. This is also a ticket only event. Star of Stage and Screen... And Three Counties Radio! Elizabeth Knight, our resident ' front man' and official promoter of all things lace was invited last month to visit Three Counties Radio in Luton where she was interviewed live on air about the craft of lacemaking. Liz took along a lace pillow, as she was to teach the presenter how to make lace. Liz had about a ten minute slot and appeared to be a 'natural' on live radio. 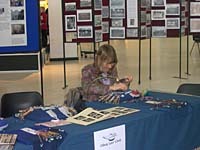 She spoke very confidently about the history of lace and did a brilliant job in promoting our Lace Circle. Beverly, our newest member was so inspired by Liz's interview that she immediately got in touch with our group. 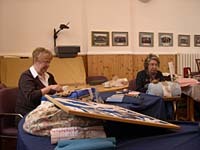 The Presenter was then shown the basic stitches and proceeded to have a go. 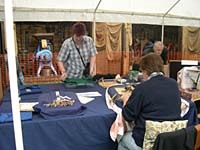 You could hear the bobbins being handled rather enthusiastically and Liz had to scold him for messing the bobbins up! 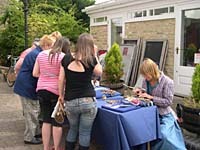 Elizabeth also made a TV appearance last month when the Antiques Road Trip visited Olney. 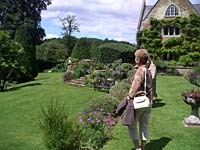 Liz was in The Cowper and Newton Museum and welcomed one of the presenters and told him a little about Cowper's house. 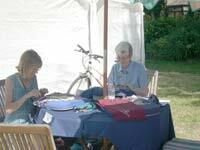 Recently, members demonstrated lacemaking at the Waterside Festival in Great Linford and Nicola, who is also a weaver took along her loom. 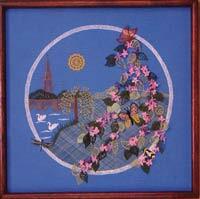 At the beginning of February 2005, two of our members went to a school in Wellingborough armed with four practice pillows so that a class of 10 yr olds could see how lace is made. They were studying the Tudors in history and had been discussing the use of lace in those times. The children were interested and attentive and all managed to have a turn. A week later we received letters thanking us, written by the children. 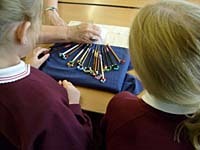 More recently some of our members attended our local school where the pupils were studying local history. 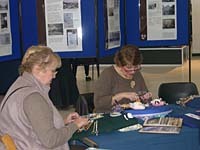 As Lace Making was a big part of town life in the 1800's it was considered an important subject. 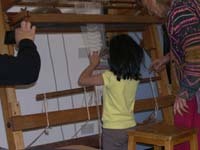 The children all learnt the basic stitch and were able to practice on the pilows we took with us. Olney has links with Newton in Sierra Leone, named after John Newton, a local clergyman who wrote the hymn 'Amazing Grace' . 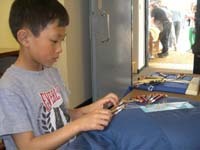 Olney - Newton project which raises money for needs in the African town . 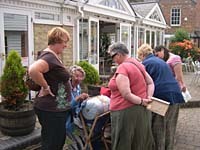 In August 2007 the Lace Circle took part in a week of demonstrations in a courtyard off the Olney market place which attracted much attention from passers by. Unfortunately the British weather was a challenge on some of the days!! 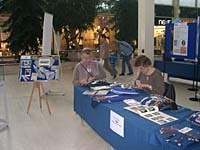 In 2008 The Living Archive presented the 'OurPlace:MK' exhibition, celebrating the Pioneers and Heroes who have played a part in the development of the Milton Keynes area.The exhibition took place in Middleton Hall, Central Milton Keynes. 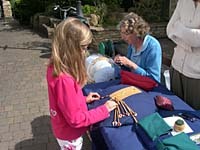 Olney Lace Circle demonstrated lacemaking as part of the display put on by The Cowper and Newton Museum. 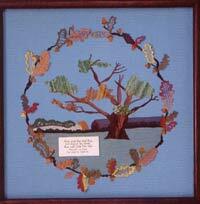 This display featured Harry Armstrong – a lace dealer who formed the Cottage Workers’ Agency in 1906. 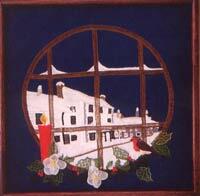 He tried hard to help the lacemakers of the town earn more money by encouraging the gentry to buy their lace. Some of the other Heroes and Pioneers of this area included Alan Turing, a code breaker at Bletchley Park, who managed to break the German Enigma codes and probably shortened the war by 2 years. Also featured was Lord ‘Jack’ Campbell who secured the existence of the Open University and was also the first Chairman of the Milton Keynes Development Corporation; and Jim Marshall who was a pioneer of guitar amplification and based in Bletchley. 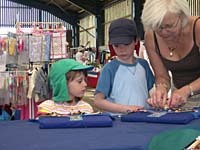 Above, a member is seen teaching young children at the Young Farmer's Country Fair. Below is the Lavenden Model Railway open day which some of us attended. We take the occasional trip out. We have visited Luton Museum to see the special collection of lace and Cecil Higgins Museum Bedford, which houses the Thomas Lester Collection. We have visited Aylesbury museum and apart from the interesting exhibits, enjoyed our lunch in the lovely garden on a beautiful hot sunny day. 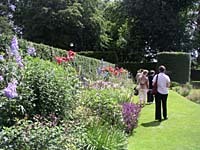 Our group visit to Coton Manor Gardens, in Nothamptonshire, was interesting and beautiful. Some people bought plants and almost everyone had lunch in the busy restaurant! 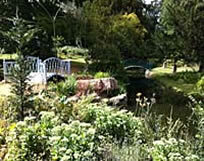 Here are a couple of photos taken when we had a Lace Circle outing to the Swiss Garden at Shuttleworth. It was a lovely day with perfect weather. 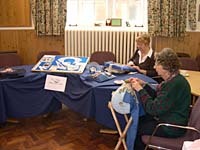 Our next Lace and Crafts Day will be at Denton Village Hall on 27th April 2019 from 10am till 4pm and a further day at Lavenden Village Hall on 28th Srptember 2019 from 10am till 4pm. These are both ticket only events.